It can be difficult to change your role from child to caregiver. 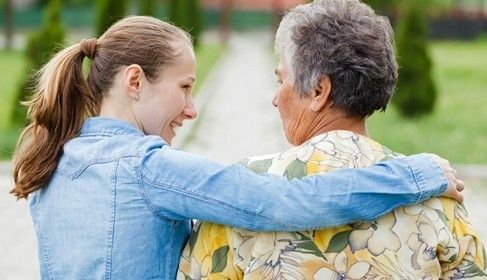 For many individuals, living with a parent with dementia can be overwhelming and isolating at first; however, there are several tools available to support you along the way. If you work or have kids of your own, the challenges of caring for your parent can be even more demanding and may take a toll on your health, family or marriage. However, by becoming more informed about dementia and Alzheimer’s and focusing on planning, you can try to balance these roles so that you, your family and your parent are living more balanced lives. Finding out that your parent is struggling with dementia or Alzheimer’s can feel extremely isolating. However, it is important to understand that you are not alone. According to WebMD, around 10 million Americans have chosen to take care of a parent with dementia. Like you, many of them are trying to balance all aspects of their lives while still giving their loved one the care that he or she needs. Before you start administering care and treatment for your parent, you need to become well-versed on memory problems that go along with the diagnosis. This can keep you well-versed on medical advancement and studies so that you know about the right treatments and medications that may benefit your loved one. Knowledge isn’t just a good thing for your parent’s well-being, it can also help reduce your stress levels as you’re in the right state of mind to deal with problems as they arise. It’s also important to understand that this diagnosis is a part of your life on an emotional level. Once your outings with your father or mother move from social to necessary and you are keeping track of responsibilities that directly contribute to your father’s well-being, such as treatments and medications, you have entered the role as caregiver. This can be a hard thing to adjust to when you are trying to balance work, kids, relationships and everything else in life. Your loved one can still live for 10 or more years with a diagnosis of dementia or Alzheimer’s. This means that your new role is a serious commitment that you will need to fully embrace in order to provide your father with the quality care he deserves. Taking care of a parent with dementia is not something that you can handle on your own. You need to take care of yourself and may want to spend time talking to others about your daily struggles with this new phase of life. This can include your spouse, siblings and doctors. However, there are many national organizations that offer support groups for children of parents with dementia that you can join for added guidance. These include your local chapter of the National Association Area Agency on Aging or the Alzheimer’s Association. If you can, find others that can help you with caregiving along the way, too. Not only does this give you a break to spend time with your family and relax, but it’s better for your parent. Spending more time with others helps an Alzheimer’s parent engage with others while participating in other activities. Living spur of the moment is wonderful when you are on vacation, but when you are a caregiver, those impromptu dinners with friends or last-minute movie nights may be hard to come by. This doesn’t mean that you can’t have a social life; you will just have to make sure that you plan activities out so that the schedule work for both you and your mother. Keeping up a positive attitude can be tough, especially when your parent can’t remember who you are or throws unfounded accusations your way. During these times, a healthy sense of humor can go a long way in helping you stay on the positive side and move on. If your father enjoys retelling an old story multiple times, let him. Instead of getting frustrated, allow your loved one to gain pleasure from revisiting the past. Switching from kid to caregiver is never easy, but it’s not impossible with some support, planning and a healthy outlook on life. If you need help, or a short break from caregiving contact the Aegis Living community near you.